A HPE c7000 BladeSystem is the ultimate solution for bulk server purchases or server roll-outs. The key configurable options for the C7000 chassis are hot-plug power supplies, power input module, hot-plug HPE active cool fans, interconnect modules and an optional redundant BladeSystem Onboard Administrator module. Once the enclosure and its key components have been selected, the following refurbished components can be added: interconnect modules, HPE ProLiant or Integrity server blades, expansion blades, and HPE OneView or Insight Control management software. The HP ProLiant c7000 includes a shared NonStop midplane for wire-once connectivity for blades to networking and storage. Redundant, Hot-Swap power supplies deliver power to the refurbished HP Blades via a pooled power backplane, this ensures that the full capacity of the power supplies is delivered to the HP blade servers. 2250W, 2450W or 2650W c7000 PSUs provide you with ample power to run the blades whilst the 2650W Platinum PSUs help you be as economical as possible. 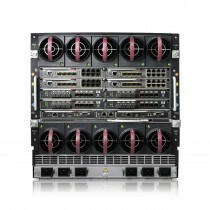 The c7000 blade centre makes use of the HP BL-series of blades, ranging from G1 to G10 server blades, it holds up to 16 HP blade servers or up to 8 compute, storage or workstation blades. Blades such as the HP BL460c Gen8 feature dual-socket nodes with up to 16 DIMM slots per server giving you an incredible 32-sockets and 256 DIMM slots in 10U of space. The rackable HP c7000 BladeSystem is aimed mainly at datacentres due to it's space saving, redundant design. More than just blade servers. Consolidating server, storage, networking and power management into a single 10U server blade chassis the HPE C7000 solution is a reliable unified environment which is easily managed. Bargain Hardware know that every business is different and so are their requirements. Bargain Hardware's online server configurators allow you to choose your bladecentre right down to the interconnect modules and power supplies. Further configurators can be found on our site for a vast range of blade servers that suit the C7000 BladeSystem. Can't find what you're looking for? Contact the technical bladecentre sales team on live chat, email or via phone +44 (0) 1254 878801.